Hm, whatever happened to that army of cyborg squid I made? Behold! The greatest invader that has ever come from the Irken Empire! Zim is the mightiest life form to have ever existed in the entire universe, he is far better than you pig-filthy earth monkeys! Zim defeats all those who oppose him, and feeds their heads to his robot! 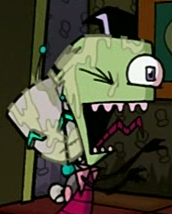 All you filthies must fear Zim! 5.3 I'm gonna eat a whole potato! Zim was born on the far superior planet of Irk in an Irken breeding tube completely devoid of earthen worm-baby birthing practices. From birth Zim's pack had him encoded as a great invader, foreshadowing the greatness that would become Zim! Once born, Zim knew he would surpass all those other puny invaders. The invader corps had absolutely no choice but to accept Zim into their ranks as he was obviously the best choice of all of Irken-kind. 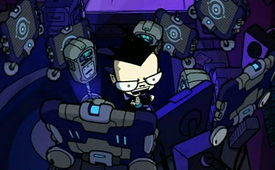 The great Zim was assigned to be the head of Operation: Impending Doom, which was a complete and total failure due to the inability of all the other invaders, other than Zim. During Operation: Impending Doom Zim masterfully piloted a Hunter-Destroyer machine, vanquishing many foes of the Irken Empire. The pitiful excuses for invaders operating the knobs and levers inside Zim's Hunter-Destryoer insisted that Zim was still on his home planet; a foolish assumption, and the fools were punished with the scorn of Zim! But, as it turns out, a tiiiiiiny bit of the massive destruction Zim had inflicted on his enemies had somehow transferred over to Irk. A minor setback for Zim, as he heroically put out the fires and restored life to many of the dead Irken using his magnificent brain! For his exceptional work in Operation: Impending Doom Zim was given a special vacation, referred to as "banishment" to all the other weak-minded weaklings, to the planet Food Courtia. Zim's vacation lasted for the entire planning stage of Operation: Impending Doom II. The Tallest, the leaders of Irk, didn't want to trouble the great Zim with the specifics of the new plan, however this led to Zim's invitation to the Great Assigning II being forgotten. It's strange how one so mighty can be forgotten so easily in such a short space of time. Get off of me you horrible robot! Aww...I like you toooooooooo. Once the great and powerful Zim arrived at Conventia the second Great Assigning could begin. The Tallest presented Zim with a sandwich (a very high honor among Irkens for you can...eat...it) for all of his marvelous accomplishments, and revealed the existence of a mission so secret that no one had even been told of its existence. The mission was so dangerous that the Tallest couldn't trust any other invader with it, so they kept it secret until the amazing Zim arrived. They even kept the planet out of every database on Irk just so the incredible Zim couldn't discover what his own secret mission was. This secret mission could only be completed with help from a very special Irken android, specially made for Zim. A Standard-issue Information Retrieval (SIR) unit wouldn't be satisfactory for someone of Zim's clearly superior caliber. The Tallest personally designed a top secret robot for Zim's ultimate mission designed to fool even the cleverest enemy. This android was codenamed GIR (not even the almighty Tallest know what the G stands for). LOOKIT ME! I'M ON THE BIG SCREEN! GIR! get off the computer! YOU'RE TALKING ABOUT ME AGAIN! AHEHEHE! GIR! OBEY YOUR MASTER! *ahem* Yes. He had been personally tailored for the amazing Zim's mission. GIR was given all the capabilities of a normal SIR, but was improved upon to be stupid! Yes, it seemed strange to m- er, Zim, at first too. The Tallest explained that GIR's stupidity is specifically designed to make the enemy think he is useless! Ingenious! How could Zim ever have doubted the all-powerful Tallest? Once Zim the Great had been briefed on his super secret mission — as if he needed it; that must have been why the Tallest cut it so short —, Zim left on his invader-issue Voot Cruiser. The journey to the secret planet took six months time. During the six months Zim used his incredible brain to begin planning his devious plan for how to eliminate the inferior species populating the planet. Zim arrived on the dirt ball, called "Earth," during what the earthanoids call "night." The darkness of night gave the amazing Zim a strategic advantage over the native dirt-creatures, called "humans," who hibernate during the night. 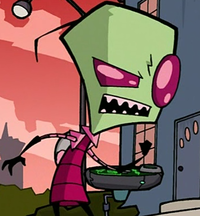 The fools didn't even notice while GIR gathered information from the surroundings and the great Zim used the information to secretly and stealthily construct their base. 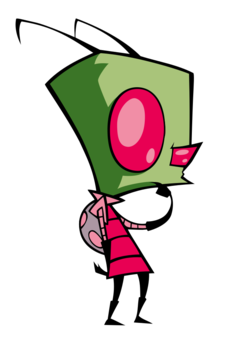 Once the base construction was completed Zim developed brilliant disguises for himself and GIR. These disguises were so perfect no human could possibly see through them with their puny eyes. PUNY EYES! The pitiful Earth creatures didn't know it, but their doom had come to the Earth! Hehe. You said "Earth" twice. SILENCE! I AM ZIM! Your pitiful brain can't comprehend the— eh? Haha! I was only kidding, I am not Zim. All you Earth monkeys should just ignore that. 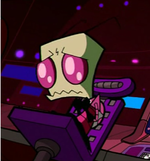 What I meant to say was Zim became as human as he could possibly be and never thought about destroying the Earth again. GIR be quiet! As I was saying, the incredible Zim then began to incorporate himself into the disgusting human society to analyze their weaknesses...in order to bring them cake! Cake for all! With disguises in place Zim's mission could officially begin. Unfortunately, a mission this treacherous and intricate could never be completed without observing the inhabitants on an extremely close level. To observe the dirt-creatures at such a close level the incredible Zim was forced to attend what the humans call "Skool." This "Skool" seems to be the humans' way of attempting to inject themselves with knowledge by the means of torture. The rooms are filled with stinky worm-babies, and the food! GAH! AH! Filthy, filthy Earth food! The young inhabitants who populate the skool were all completely fooled by Zim's brilliant disguise. All of them except one. One of the Earth pig-filthies named "Dib" insisted that Zim was an alien for reasons that had nothing to do with a fault in the amazing Zim's disguise and everything to do with a fault in Dib's human brain-meats. Using his superior intellect, Zim was able to foil Dib's attempt to convince the class that Zim was an alien sent to destroy the planet. Haha, what a silly idea. Zim only wants to be friends with you Earth-smellys. However, this first encounter merely antagonized the Dib-creature, who proceeded to try to stop Zim's mission at all costs. Even such a great invader as Zim will be forced to overcome certain obstacles during a mission as important and difficult as Zim's. The masterful way in which the incredible Zim maneuvered around these pitiful human obstacles reveals his amazing skills! Zim's amazing robot parents displaying a normal human response to a missing limb. The humans had apparently prepared for the possibility of someone infiltrating their skools and had devised a system to reveal these infiltrators. Their paternal natures lead them to be interested in every facet of their filthy children's lives. Obviously, an invader of Zim's skill would come to Earth alone, thus leaving him without "parents" to go to meet his teacher on parent-teacher night. Zim, being far better than your standard invader, devised a devious plan: robot parents. Unfortunately, the invader-issue robot parents were not up to the task that would be asked of them. Zim's magnificent brain came up with an ingenious idea; to flood the robo-parents' A.I. brains with examples of normal human parenting via what the humans call "TV." This TV viewing would give the robot parents the best examples of parenting available, as even humans couldn't be stupid enough to have authority figures portrayed poorly on public entertainment! After twenty-four hours of social programming the robot parents were ready for their mission. The robot parents performed remarkably just as Zim expected them to. Their mission went off without a hitch and all the pig-filthy Earth-creatures were completely fooled! GIR! Ha ha. Yes, there were two minor mishaps, BUT ONLY TWO! One of the robots miight have decided to begin poking other parents in a threatening manner, and the other might have had its arm explode, but this was no fault of Zim! Zim's plan was perfect! After the first mishap the Dib-human began pointing and shouting, attempting to alert his fellow humans. He acted like it was not all a part of Zim's ingenious plan! After all, who would suspect the child whose mother was randomly attacking people? Hahaha, foolish human! Human germs are best fought while trembling in the fetal position. Zim's home planet of Irk had epic tales of tiny, invisible creatures that would cause incredible amounts of discomfort. The Irken wiped out these tiny offenders ages ago. The humans, obviously, were not as proficient at wiping out their enemies as the great Irken Empire. What the Earthanoids call "germs" are much better defenders of their planet than the humans. Because of this, the inferior humans are often satisfied to let the germs do most of their killing for them, and so an invader of Zim's caliber must defend himself from these tiny threats. Fortunately, every Irken invader is trained to deal with threats of every size. Zim's incredible invader instincts kicked in and Zim calmly handled the situation without arousing any suspicion at all, and with only a minimal amount of terrified screaming. The magnificent Zim used his amazing brain and technology to analyze the germs' main weakness. Utilizing the humans' meat technology Zim was able to fashion a suit of meat-filth and paste. This ingenious idea allowed Zim to cover himself in meat paste to keep the germs at bay while continuing to appear completely normal to the human worm-babies. This meat suit allowed Zim to be even more protected from the humans' pathetic germs than the humans themselves! 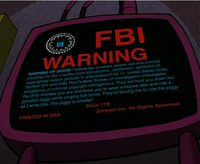 The last, pitiful, attempt to stop Zim's mission was the sad excuse for an alien elimination program known as the "FBI." These FBI humans put tracking devices in every video device in the entire planet. Zim's mighty brain saw through this clever ruse, which led him to attempt to dispose of the video tape that GIR had stupidly brought into the base. But I neeeeed it! I need it or I will explode. Because of this oversight the incredible Zim was forced to return the video to the mall to prevent discovery by the humans. Unfortunately, the FBI had already been alerted of Zim's intentions and dispatched a FBI human from the "mall security" division, by far the most dangerous division. Fortunately for Zim, mall security had never faced such a proficient foe as Zim. The tactics the FBI used to subdue the mighty Zim were rudimentary at best, and were easily thwarted by far superior Irken tactics. Even so, Zim somehow ended up in an underground holding cell with a number of filthy humans. After some minor convincing, Zim convinced the humans to construct a way out of the pitiful holding cell using their disgusting bodies. Zim climbed the pyramid of meat bags to safety only to be faced with an army of shambling zombies that mall security had made using the zombie lab they'd just put in. Fortunately these were merely human zombies and were easily defeated by Zim. With a simple look they began to fall apart, and not because of their rotting corpses, no! It's because of Zim's incredible eyes! They all fell over and went like this "KA-BLAMO!" Yes, that was me! Er...Zim! Don't question me! Even though he is only an inferior human, Dib proved entirely too meddlesome. However, even a mediocre enemy such as this Dib interfered enough times to warrant documenting his methods for further study. This filthy Earth stink would, despite his best efforts, only serve as a warning to other humans not to interfere with the mighty Zim! Even your own family betrays you Dib! Water. More than half of the filthy planet is made up of this poison. The Dib induced some kind of trap where the clouds from the human atmosphere formed the stuff. Luckily, Zim's mighty invader skills took over and he was easily able to avoid the water falling from the sky until the stupid human's trap was over and done with. After learning of this minor weakness in Irken physiology Zim worked tirelessly to come up with a way to counteract this effect. It was at this point that Dib made his final mistake in the battle of water. Apparently, the falling water trap had become too tiresome for pitiful Dib, and he stupidly altered his plan to include exploding latex balls holding water. Although the first strike was successful, for a human, the compound the humans call "paste" was harvested from the attack and analyzed as being immune to the poison effects of water. After the defeat of the Dib-smelly Zim once again turned his attention to the destruction of Earth. The first step in the new plan began with a scouting mission to the near-by planet of Mars. Computer scans of the surface of the planet had revealed evidence that another species of creature had inhabited the surface of Mars at some point. Zim's amazing brain thought that whatever eradicated the Marslings could assist in also wiping out the humans on Earth. It was while on this scouting mission that Zim discovered something the pitiful humans had missed; the entire planet was outfitted with giant engines to propel it through space. 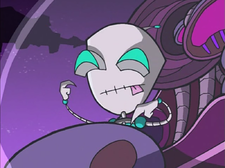 After finding this Zim decided it was a much better idea than what he had planned earlier, which was to find a popstar on Mars and bring her/it to Earth to cause massive panic, and instead brought Mars to Earth to crush the entire surface, killing all the humans. Maintenance required in main base! Eh? Can't you fix it yourself? I'm busy! Euurrrr. Fine! GIR! Don't touch anything while I'm gone. I think something is wrong with the main computer core. I'm gonna eat a whole potato! Hiii! I'm gonna show you my bees! AHAHA!...um, wanna watch the scary monkey shooooow? I like it. Ahehehe! You wanna taco? I liiiike tacos! And pigs! The piggies are my frieeends...Ahahaha! I made cupcakes! They got peanuts and bacon and lobster and pizza and tacos in 'em! Mhm. I'm gonna eat 'em all! Hehehe. I'M GONNA TELL YOU A STORY ABOUT GIANT PIGS!! But ooonly if you do a dance. DAAAAANCE! Ahehehe!....... I'm guarding the computer for my master! He's fixing the baaase. GIR! What are you doing? Noooothing... You weren't messing with anything while I was gone? Noooo... Good. Now where was I? Ah, yes. Once the filthy human disrupted Zim's plan to crush the humans with Mars, Zim decided to deal with his nemesis once and for all. With the simple use of a do-it-yourself kit Zim was able to construct a space-time object replacement device to send a hunter-destroyer back into the past to deal with the Dib. Unfortunately the drivers on the hunter-destroyer were outdated, which caused the extremely advanced machine to be incompatible with the even more advanced Irken time-stream manipulator. Fortunately, Zim was brilliant enough to discover that the stuffed pigs the human-monsters loved so much were suitably un-advanced enough to work with the time machine. I've got you now Zim! Now everyone will know your secret! This let Zim unleash his brilliant plan with one minor revision. Instead of sending a giant robot to destroy the filthy human Zim had to instead replace vital objects in the human's past with piggies. NOOO! My piggies! Quiet! Yes...Zim's amazing plan went off without a hitch as various things from Dib's life were replaced with stuffed pigs. Replacing stupid human devices such as bicycles and hover helmets led to elimination of the Dib human from history, thus he was unable to interfere in any of Zim's plans. Ever. Hahaha. Hahahahaha! HAHAHAHA! *szzkt* Eh? GIR what did you d- *szt* Hey! I got through! Ok, now I have to keep his base from kickin- *szzt* -puter! Trace the connec- *zzz* Ok, that should do it. I have to warn all of you about Zim's plans to eradicate the human race! Listen, Zim was sent as an alien invader to take over our planet, don't believe anything he says. His disguise isn't even that good! Insolent fool boy! I should have known it was you Dib! Zim! I can't believe you'd think that anyone would listen to your blatant lies! Huh?! I have no, absolutely nooo, idea what you're talking about. I'm just here with my normal family and my...dog monster. I like taquitos! GIR! Human dog creatures don't speak! Ooooh... ....How does nobody else see that you're an alien!?! Because I AM A GENIUS! Not genius enough to stop me! Listen to me people of Earth! Your planet is under attack by an alien who goes by the name of Zim! Nooo! He's lying! Don't listen to him! I'm not lying! He has green skin! Just look at him! I beg you people, don't believe his outlandish lies! He's only here to destroy you! NO! You're ruining the mission! THE MISSION! Yaaaaaay! We're doomed! How's it feel Zim? Soon everyone will know that you're an alien and I'll get all the credit! Oh, you horrible, interfering- you'll pay for this Dib! YOU'LL PAY! Not likely Zim, soon the FBI and CIA will be knocking on your door to take you back to their base and experiment on you! PAY! ..O...K. I think you're going crazy. You're the one who's crazy Dib! You and your..big head! My head isn't big! I'll have you know I've had it looked at and it's fine! Oh, I'm sure doctor daddy told you that. How's it feel to have the biggest head in the universe? My. Head. Isn't. Big! I LIKE YELLING! HEHEHE! GIR! NO!! Your tricks won't work on me Zim! I know this is just to distract me! GIR! OBEY YOUR MASTER! BE SILEEEENT!! I'M DANCING LIKE A MONKEY!! I...don't know what this is, but it won't work! You hear me Zim? It won't work! GIR! I order you to stop this at once! Do you hear me GIR? AT ONCE!!! You mean he does this a lot?Uh huh. Wow! He's a terrible evil minion. Yep. DU DU DU DU DU DU DUDU DU DU DU DU DU DU DUDU! Well...I've got to go save the Earth some more. Good luck with that.